A super easy step-by-step guide. The arrival of Spring inspires all boaters to begin the process of reviving their boats, in anticipation of getting back out on the water. Just as you strategically prepared your boat for Winter, Spring commissioning should be done methodically, and in an order that prevents costly errors and system failures. You’d be surprised how many people I hear about who forget to put the drain plug back in their boat the first time they launch it after winter lay-up. 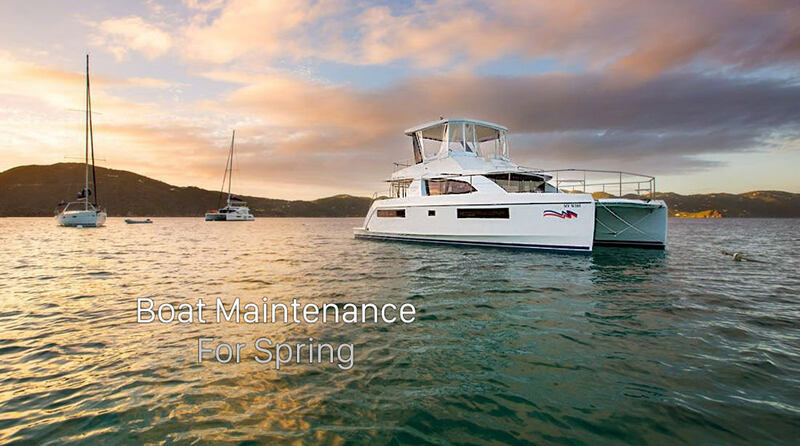 Here are some basic tips for getting your boat spring ready. Remove the cover, taking a minute to inspect the cover for any holes and cracks that may require repair before next season. Ideally you cleaned your boat in the fall, so it shouldn’t be too much effort to clean and scrub your boat from top to bottom to remove wintertime dirt and grit from the outside, taking care to polish that metal. Inspect all mounts, clips and anything that may have come loose over the winter. Now is the time to add a fresh coat of wax, especially to spots that you were unable to cover and protect during the winter. This is my least favourite task to do, but the results are well worth it. Waxing is very important for protecting the hull and is also helps your boat move smoothly through the water, reducing drag and improving fuel economy. Make sure you flush freshwater systems of any antifreeze with clean, fresh water. Fill your water tank and then open all the freshwater outlets in your boat systematically, one at a time, and flush the system until perfectly clear water comes through. Don’t forget the transom or anchor wash faucets. Open seacocks and through-hull fittings before running inboard engines. This is a costly mistake, as you could potentially cause engine damage. Likewise, ensure there’s cooling water flowing from your outboard(s) the first time you run them. Refer to your owners manual or contact your marine mechanic with any questions. Carefully commission sanitation systems, specifically that you position Y-valves and seacocks in their legal positions, so waste goes into your holding tank and not into the water. Ensure bilge pumps are in good working order before you launch by adding water to the bilge with a hose or five-gallon bucket. If the pump removes the water, you’re generally good to go. It’s a good idea to add a coat of antifouling paint to the bottom of your boat, and while you’re there check zincs, examine propellers, and look over every inch of the hull for cracks or wear. PUT IN THE DRAIN PLUG. I realize I’m being Captain Obvious, but always make sure the drain plug is properly fastened, and you have a spare on board. This will ensure your first spring trial on the water doesn’t turn into a swim. Before dropping your boat into the water, you should consider any 3rd party work you want to get completed. This includes having window films installed, paint touch-ups, or mechanical fixes that might be more easily completed out of the water. With these few steps, you can be assured that your first trip this year on the water is safe, fun, and successful.